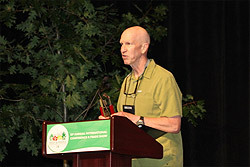 CHAMPAIGN, Ill. (August 2013) – Terrill Collier, an arborist, owner and president of Collier Arbor Care in Portland, Ore., is this year’s recipient of the International Society of Arboriculture’s (ISA) prestigious Honorary Life Membership Award and has been named an ISA True Professional of Arboriculture for 2013. The Honorary Lifetime Membership is awarded to ISA members who have contributed substantially to the progress of arboriculture. The True Professional recognition programme honors arborists and tree care professionals for their positive impact on the industry and around their community. ISA President Terrence Flanagan honored Collier in ceremonies on Sunday, August 4th and Monday, August 5th in Toronto, as part of the ISA Annual Conference and Trade Show, held August 3rd—7th, 2013. As a second generation business owner, Collier has transformed Collier Arbor Care into one of the top arboriculture firms in Oregon. From conducting pro-bono work on historic tree care to raising thousands of dollars bike riding in the Tour des Trees with his family to fund tree research, Collier carries out his daily activities with a quiet demeanor, a positive attitude, and a willingness to share his knowledge with others. Collier is one of five members in the 2013 Class of True Professionals. ISA launched the recognition programme in 2009 to increase public understanding of arboriculture and the professional skills of today’s arborists. Nominees selected for recognition represent various backgrounds as ISA Certified Arborists, urban foresters, authors, and business owners—all advancing the cause of the industry. the consumer education web site, www.treesaregood.org, which fulfills the association’s mission to help educate the public about the importance and value of proper tree care. Also, as part of ISA’s dedication to the care and preservation of shade and ornamental trees, it offers the only internationally-recognized certification programme in the industry. For more information on ISA and Certified Arborists, visit www.isa-arbor.com.